In the world of Korean Skincare, essences are like serums, where a boost of nutrients and beneficial ingredients is applied to the skin before applying moisturiser. 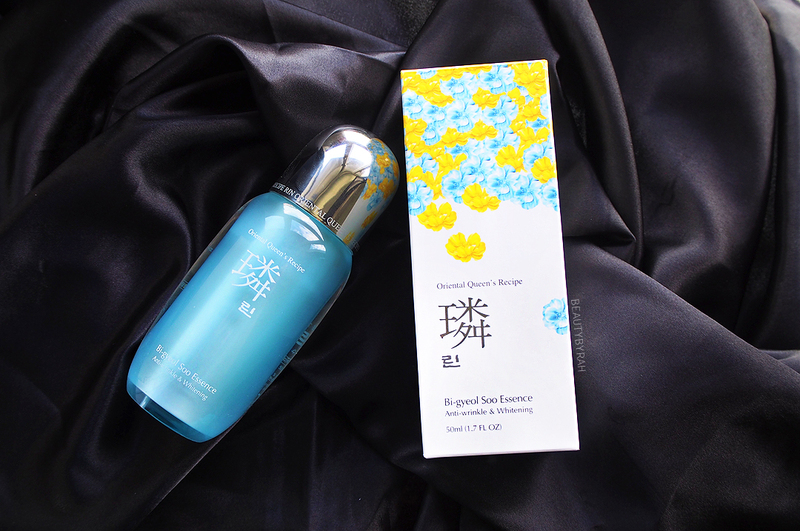 This Hansaeng Cosmetics RIN Bi-gyeol Soo Essence came in my August BNT Beauty Box as well, and it came in good time, as my serum just ran out then. 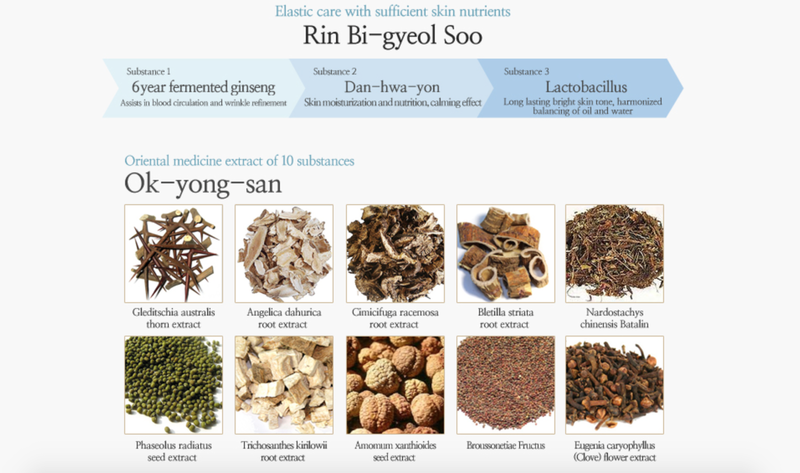 This RIN Bi-gyeol Soo Essence is supposed to provide intense moisture and nourishment from six-year-old fermented ginseng, oriental herbal complex called Danhwayeon and other oriental ingredients. It also claims to help in wrinkle refinement and in whitening as it also contains sodium hyaluronate which let the moisture penetrate deep down your skin, niacinamide which clears the brightens skin and adenosine which firms your fine lines. There are also tons of extracts from oriental medicine ingredients. This essence is comes in an opaque blue bottle and has a pump, which is always a good addition to keep it fuss-free and hygienic. Packaging wise, I am a fan. The opaque bottle with a pump helps to enable the beneficial ingredients to last much longer due to little exposure to air and light. Looking at the ingredients list, I am quite impressed. There are quite a bit of skin-repairing ingredients (lecithin, sodium hyaluronate), cell- communication ingredients (niacinamide,sodium hyaluronate, adenosine) and antioxidants (niacinamide, panax ginseng root and tocopherol acetate). Examples are just some of them! 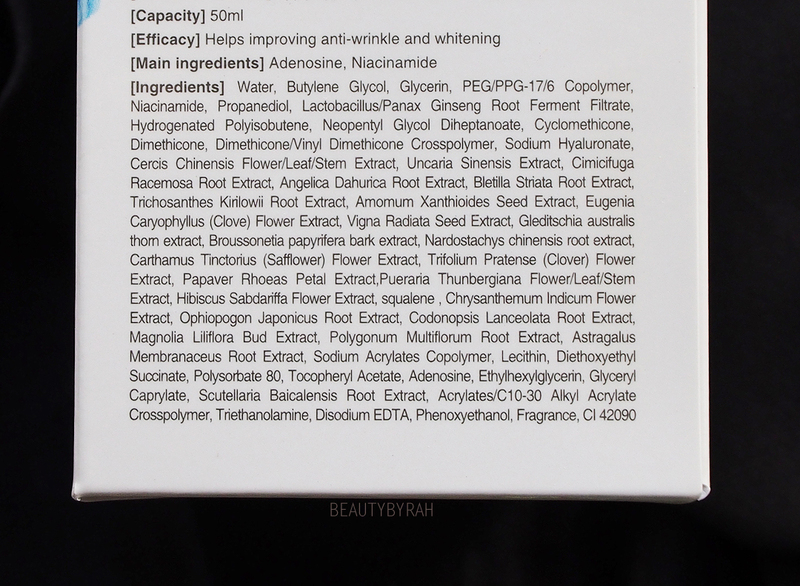 I also researched on some of the ingredients listed, especially those that are higher up the list, through Paula's Choice Ingredients Dictionary and none came back as a bad ingredient that can potentially irritate the skin. There is fragrance, but it is the second last ingredient on the long list, so the chances of it irritating the skin are not tremendously high. When pumped, the essence is quite viscous, and is of a slight gel texture with a blue tinge. The blue tinge is due to the presence of CI 42090, which is a cosmetic colourant. Once massaged into the skin, this essence becomes watery and absorbs nicely into the skin. It does leave a slight tacky feeling after, but that does not bother me as I will follow up with moisturiser and a facial oil after anyway. I have been using this for 2 weeks so it is difficult to comment on definite results. A good point to note is that I did not break out from this. I do, however, notice that my skin is more moisturised and hydrated (as can be seen from my lack of dry patches and smaller pore size around my nose). In terms of wrinkle refinement, I can't comment on that as I do not have any noticeable ones that I can really test on (and I am very thankful for that currently). My skin does look slightly brighter in terms of complexion, but my dark spots and scars still do look as of same intensity. Then again, skin care is something that really needs time to work and since the skin's renewal rate is about every 28 days, patience and perseverance is key. I will keep using this till I finish it and I will update here, if I see any particularly outstanding results. This retails for 46000 Won (or about SGD 55.60). **This product was sent for a review. Only honest thoughts are shared here, with no influence from others. I am not compensated nor affliated to the brand.